Hemlock Woolly Adelgid (Uh-dell-jid) (HWA) is an introduced, aphid-like insect from Asia that attacks eastern hemlock. As of 2011, eighteen states from Maine to Georgia have HWA . Many areas infested with HWA display extensive tree decline and mortality. HWA affects all species of hemlock, but does not affect pine, spruce, fir or other conifers. The most obvious sign of HWA is the covering of wool-like wax filaments produced as the insect matures. The woolly masses generally range from about 1/16-inch to 1/8-inch in diameter. They are most visible from late fall to early summer on the undersides of the outermost branch tips of hemlock trees. Trees that have been impacted for years will also display off-color needles, often with a grayish-cast; thinning crowns, premature needle loss. Note: In Maine this insect does not damage trees other than hemlocks. How do I know if I have a hemlock? 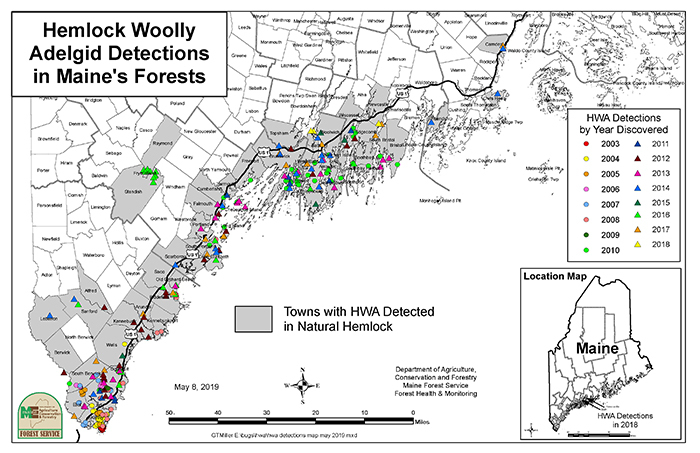 As of 2013 hemlock woolly adelgid has been found in forests of more than 30 southern and coastal Maine towns. Most detections are made by informed citizens. Many things look like hemlock woolly adelgid at first glance. On closer inspection, they can be ruled out either because of their texture, their location or another characteristic. Remember, HWA will usually be found on the undersides of twigs at the bases of needles and is coated with a waxy material. When in doubt, please contact us. Elongate hemlock scale can also be mistaken for hemlock woolly adelgid, and is often found on hemlock trees already infected with HWA. Please let us know if you think you have found elongate hemlock scale. Hemlock woolly adelgid appears to be widespread in the towns of Harpswell, Kittery, Westport Island, and York and may be widespread in other communities, especially on coastal peninsulas and islands. Elongate hemlock scale has been found in the forests of Kittery and on planted trees along the south coast. In 2016 it was found to be well-established in Frye Island. Small, scattered populations were also found in Standish and Raymond. It is likely more widely distributed in forests and landscapes. When scale and adelgid are found together, they may hasten the decline of hemlock. Some chemical treatments for adelgid are not effective against elongate hemlock scale. If you suspect you have found elongate hemlock scale, please contact us. We suspect HWA is established in other townships in that general climatic region. The mild winters since 2009 have allowed populations to build enough to reach detectable levels in areas where they had previously been established but at sub-detectable levels. All towns in Lincoln, Sagadahoc and York Counties. Counties in the Northeastern United states under quarantine for hemlock woolly adelgid (right) shaded in brown and yellow. Click on image for a link to the latest US Forest Service maps. 1999 - Hemlock woolly adelgid was inadvertently shipped to Maine from Connecticut on untreated nursery stock . The infested stock was treated and monitored for insect survival. 2000 - Hemlock woolly adelgid infested outplanted hemlocks were found in new locations. Some of the hemlocks exhibited relatively heavy infestations indicating that they were infested when planted. 2003 - Natural spread of hemlock woolly adelgid was detected in Kittery and York forests. These sites were considered to be the northern edge of the general infestation in eastern North America. Spread was most likely from natural movement by wind, birds and/or mammals. Management tactics in this area focus on containment. 2004 - A small hemlock woolly adelgid infestation was found in Wells, Maine. Beginning in 2004, new control measures included pesticide treatments on sites with a high probability of further spread, high HWA populations and human activity, and HWA predator beetles released into remote infested areas as a biological control. 2006 - No new towns detected, but continued new discoveries in towns known to have established adelgid, and known populations began to intensify. Infested planted tree detected in Southport. 2007- Infested planted tree detected in Brooklin. 2008 - Park Ranger, Janet Mangion, discovers hemlock woolly adelgid during routine road-side maintenance at Ferry Beach State Park in Saco. Press coverage of the detection yields reports of infested outplanted hemlocks in South Portland and infested forest hemlocks in Kennebunkport. Follow up surveys reveal a low-level infestation throughout Ferry Beach State Park. 2011- Hemlock woolly adelgid detected in Cape Elizabeth forest trees. Infested planted trees confirmed in two locations in Mount Desert. 2012 - Forest infestation found in Alfred, Arundel, Berwick, Biddeford, Kennebunk and Topsham during the Maine Forest Service detection survey. In August, a trained volunteer detected a forest infestation in Scarborough and a homeowner detected infested planted trees in Sedgwick and a caretaker reported infested trees in Northeast Harbor (the latter two locations had co-infestations of elongate hemlock scale). 2014 – Forest infestations found in Lebanon and Sanford through remote sensing during Master’s thesis work by Justin Williams, UNH. Forest infestation found in Friendship and Owls Head during Maine Forest Service detection surveys. Quarantine External (between states) and internal (within Maine) quarantines regulate movement of hemlock materials to reduce unintentional movement of HWA. Surveys & Monitoring Maine Forest Service personnel regularly survey to locate new infestations and monitor the spread of HWA. Impact assessment plots have been established at five sites in Maine. Data from these sites will add to the understandingof forest impacts of the adelgid, and will be analyzed along with information collected in Vermont, New Hampshire, Massachusetts and Connecticut (impact plot summary). Chemical Control In the spring and summer HWA can drop onto humans and vehicles and may be moved into uninfested areas. Treating infested trees in high-traffic areas, such as roadsides and residential sites, can reduce accidental human spread of HWA. Public Outreach An informed public plays an important role in detecting HWA. Programs such as “Take a Stand” enlist public support and educate volunteers in HWA detection. Maine Forest Service also cooperates with Vital Signs to increase citizen monitoring for the pest (see their HWA Field Mission). Press releases help raise awareness about the threat. While there is little you can do to prevent natural spread of this insect, you can help reduce the likelihood of hemlock woolly adelgid coming to your backyard and thriving in your trees. In our climate, there is usually time to “rescue” tree health on ornamental trees after detection of these insects. And, if forest trees are being monitored there is usually time to plan a response before widespread damage from the insect. Do not move hemlock trees, seedlings or nursery stock from infested areas (Maine Map). Please check any hemlock plantings and forest trees for adelgids. Discrete white cotton ball-like masses on the undersides of the twigs, usually attached at the bases of needles. Usually up to 1/8th" diameter. Try to look twice a year; in late March (eggs present so wool is at its fluffiest) and early November (on new growth, settled nymphs will have just started to feed and develop their waxy coating, remnants of old wool may still be visible). Use the photos for a guide, for more photos visit our Hemlock Woolly Adelgid Web site. Look at lots of branches (hundreds would be good). Cover the area that you are concerned about. Do not fertilize hemlock yard trees if you are near infested areas (adelgids thrive on the nitrogen enrichment provided by fertilizer, much like aphids). Remove bird feeders in the spring and summer (April through August) to reduce the number of birds drawn to your trees. Birds can transport HWA short and long distances. Prune live hemlock twigs and branches likely to come in contact with delivery vehicles and other things that may have contacted infested trees. Within 20 miles of the coast, consider pruning hemlock branches near trails and resting spots where people can inadvertently introduce the insect. Whenever possible, plan harvesting in hemlock for August through February when eggs and crawlers are not present. For more information on management planning for hemlock woolly adelgid, see Silvicultural Options For Managing Hemlock Forests Threatened by Hemlock Woolly Adelgid (Orwig and Kittredge, off-site). learn more about management here. Volunteer to survey for hemlock woolly adelgid in your community.